I've enjoyed lately DC Comics's post-Infinite Crisis series of space-faring "cosmic odysseys" as penned by Jim Starlin (including Mystery in Space). I'm also currently enamored with the New Gods, having just finished the fourth volume of Jack Kirby's Fourth World Omnibus. Starlin's Death of the New Gods, therefore, would seem like something of a lock for me. But while I can't bring myself to complete pan this book, this is not exactly good comics. Starlin obviously loves the Fourth World characters and his care shows in a number of instances in the book, but ultimately I couldn't help but notice a number of missed opportunities that kept this from being more than just a standard cosmic superhero adventure. Jack Kirby's Fourth World characters are big on personality and inner conflict; the brilliance of Kirby's stories was how they worked to bring this inner conflict out (see how "The Glory Boat" intersects with Orion's struggle between war and peace). Writers after Kirby have to work to find new ways to address the characters' archetypal conflicts, else the characters become flat or hackneyed on the page. This is not to say that every appearance of Mister Miracle, for instance, must address his childhood trauma, but a Fourth World-focused story like Death of the New Gods must at least hit the high notes. Starlin does little of that. 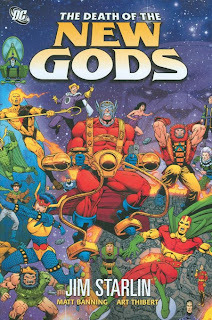 This is The Death of the New Gods; that is, the eight-issue conclusion to thirty years worth of stories that captured enough hearts and imaginations as to warrant a giant hardcover series reprint. And yet, the main action only involves about three or four major gods of New Genesis cut from a cloth of hundreds, and from Apokolips mainly Darkseid. When Starlin gets down to the end, you'd think there might be some acknowledgement that Orion and Mister Miracle are near spiritual brothers, or that Orion might want to acknowledge the death of his good friend Lightray, or that Starlin might want to angle it so Orion and Darkseid can actually speak to one another in the penultimate battle, but none of these things happen. What takes place instead is a kind of faux-action that I think we often see in comics crossovers (thinking about this for a minute, Uncle Sam and the Freedom Fighters, much as I liked it, is another example). That is, the characters don't so much as act as they move from place to place and opine for a while -- Superman and Mister Miracle are in space, then they're on New Genesis, then they're on Apokolips, then they're back on New Genesis, etc. Starlin populates the story with a number of unnecessary fight scenes, too, including a Superman/Orion throw-down in the beginning (a fight each character should be better than) and a Superman/Mantis/Kalibak fight in the end that also fails to move the plot along. There's some glee, don't get me wrong, in watching Superman and Kalibak throw down, but not perhaps in the waning moments of Death of the New Gods. Some of this glee, mind you, is what helps to redeem Death of the New Gods. Starlin certainly gets the look of the New Gods right, from his big-headed Kalibak to Darkseid in the shadows, to his always angry-looking Orion. While Starlin's characterization was at many times off (the whininess of Mister Miracle being the most egregious example), he managed to give Orion a fitting warrior's death, and Starlin's Mantis was so attuned to Kirby's version that I had to smile. And I appreciated any of a number of references Starlin makes to Fourth World tales past, from Crisis on Infinite Earths to Genesis to Cosmic Odyssey, plus quite a few Kirby tales. There's no question that Death of the New Gods is akin to Kirby's Fourth World tales, and the completists among us might find it an interesting diversion. The difficulty is that this is meant to be the last New Gods story ("Whatever Happened to the New Gods? ", if you will), and it didn't reach quite that level for me. Batman: Gotham Underground is another recent all-encompassing mini-series meant in part to bid farewell to the current Batman status quo, and here I thought writer Frank Tieri succeeded, using nearly every member of the Bat-family in some capacity; it's this I might have liked to see in Death of the New Gods, and did not. Let's not miss my first statement, though; I have been enjoying Starlin's recent space stories, and I fully intend to follow them; likely I've judged Death of the New Gods far more harshly because of it's place in history than I would if it were just another story. For now, we continue the road to Final Crisis with Countdown to Final Crisis volume 4, coming up next. "as to warren a giant hardcover"
You mean "as to warrant a giant hardcover." Sorry. You hit one of my pet peeves. Totally right. I know better and that's a typo. Fixed; thanks for pointing it out (though I'm scared now the chaos that will ensue if my readers start looking for my typos in earnest. Not too many, I hope!). Great review. I echo your feelings on Starlin. I have always loved his work with the cosmic characters over in the 616 Universe. And I left like Starlin was the spiritual successor to what Kirby was doing for Marvel. But, Starlin's effort on Death of the New Gods was disappointing. Mostly, because I do think highly of Starlin and I expect better from him than what we got with this story. If you don't mind me asking I was wondering why the hardcover version of this goes for 30 dollars in some places, is the hardcover actually that nice? The retail price is $30, but I imagine you can find a discount from Amazon or another online vendor. No difference in content between the hardcover and paperback as far as I know.